Potentially disturbed weather coming up next Fri. Hard to know how this will look by Fri due to the complex nature of how the depressions will form and interact with the jet, and possible spin off Lp's . 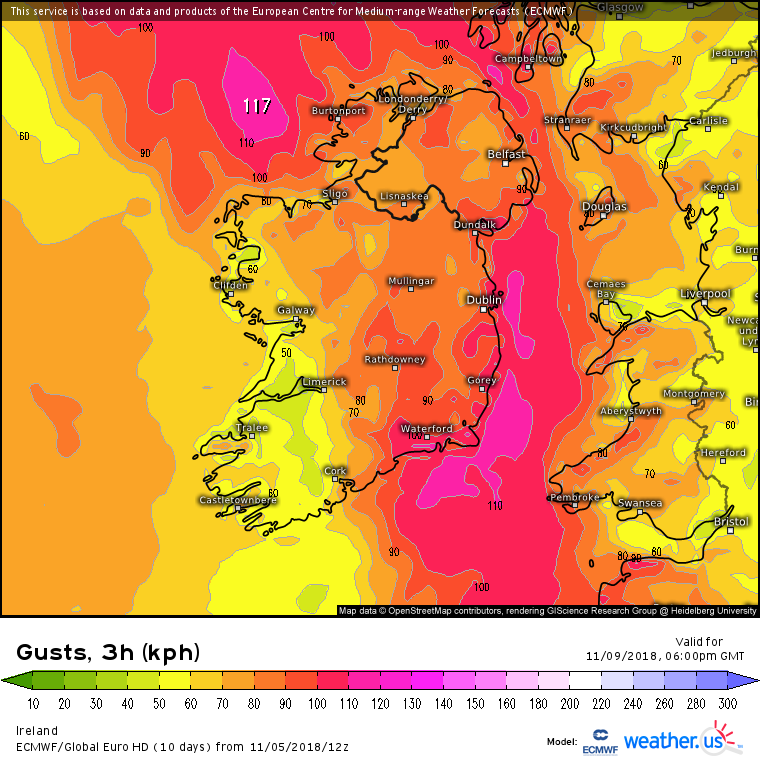 Will be interesting watching the models handle the upcoming spell of unsettled weather. 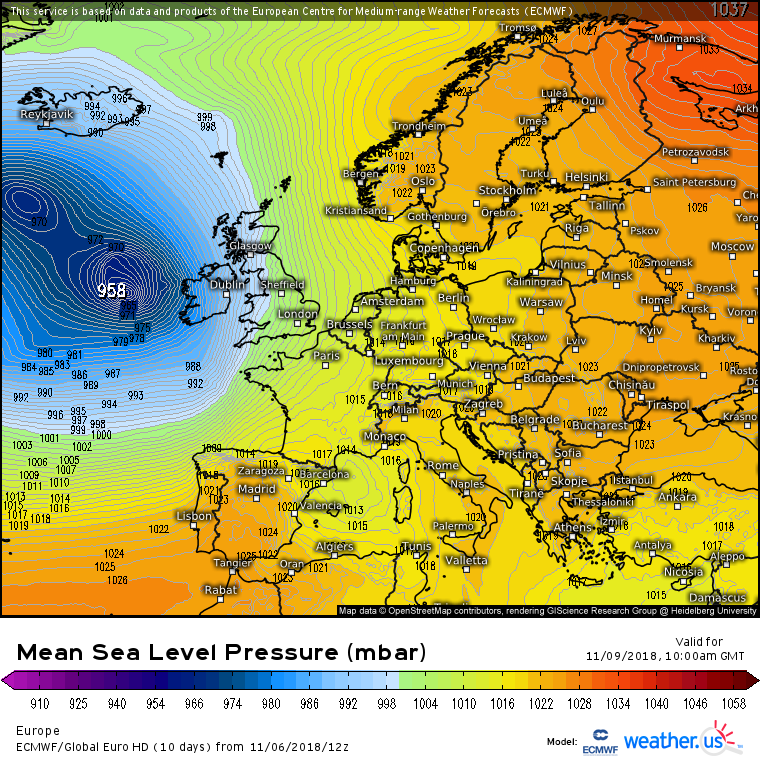 Just on the cusp between this thread and +120hrs , so a fair degree of uncertainty. 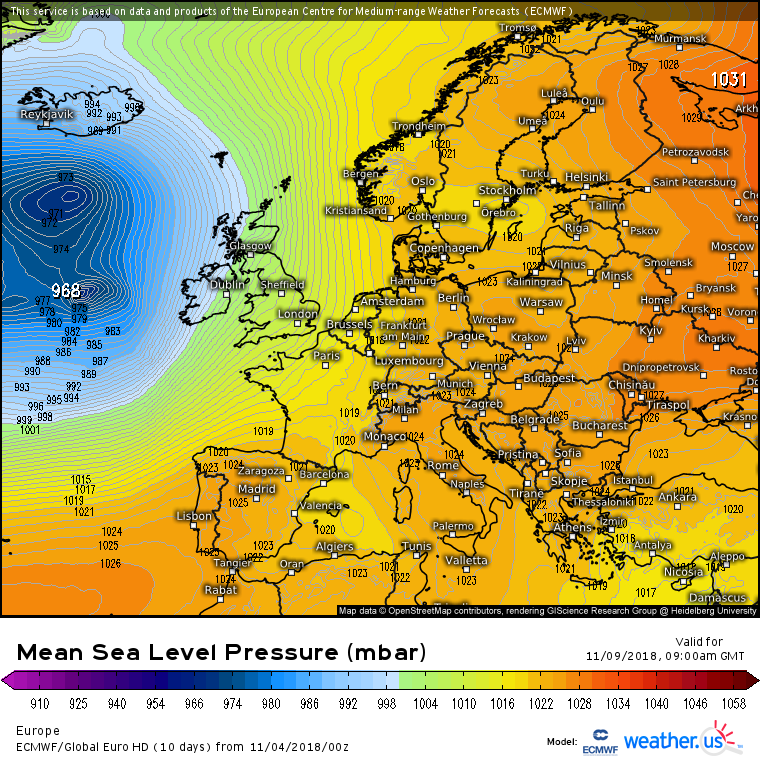 Worth keeping an eye on. 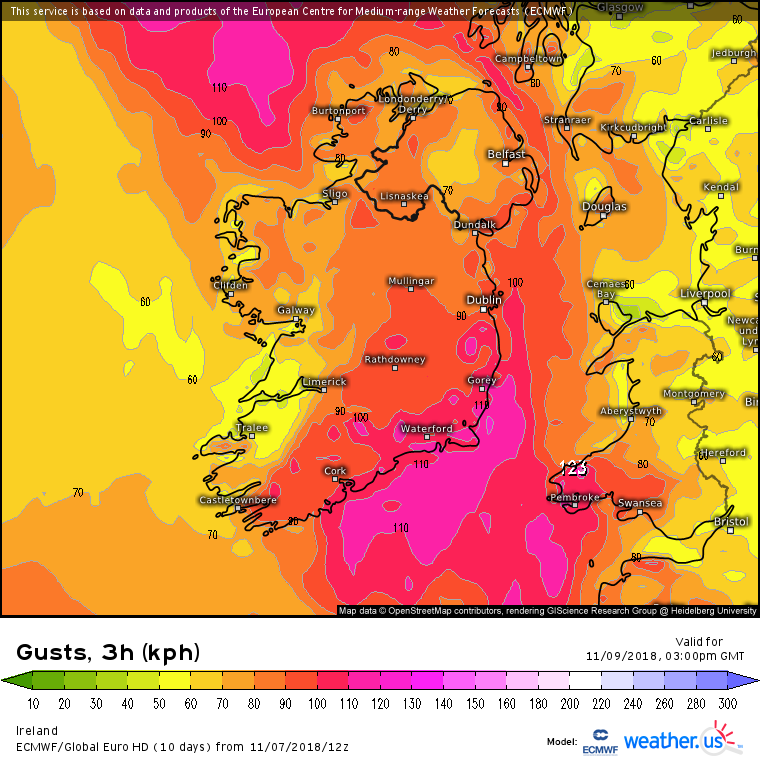 ECMWF 12Z Looks like very strong winds Fri on this run tight gradient as the system deepens close to Ireland. Long way off though . Only borderline Orange at the moment. Still a long way off. 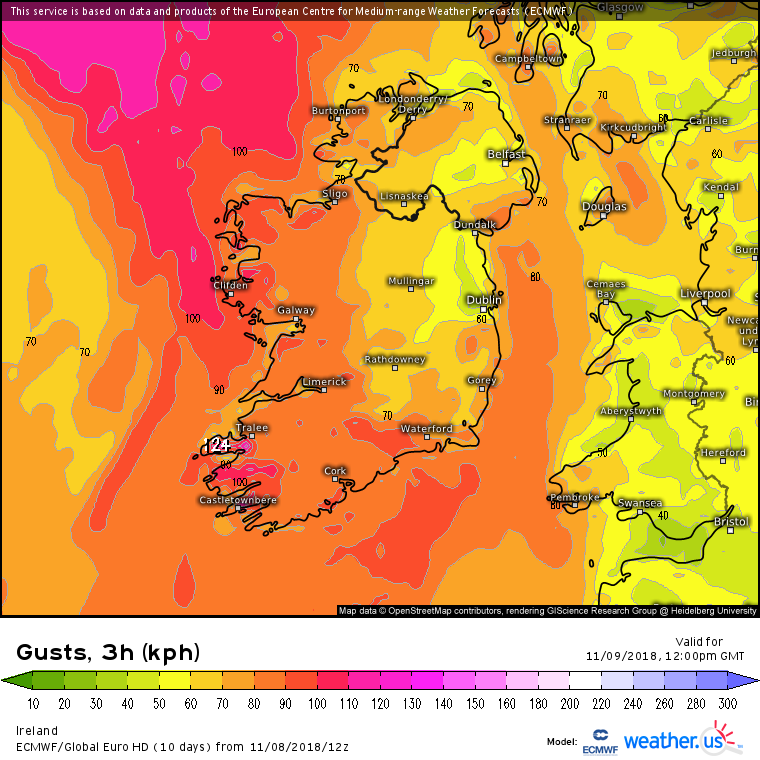 Would affect east coast also with strong southerlies probably delaying or cancelling ferries. 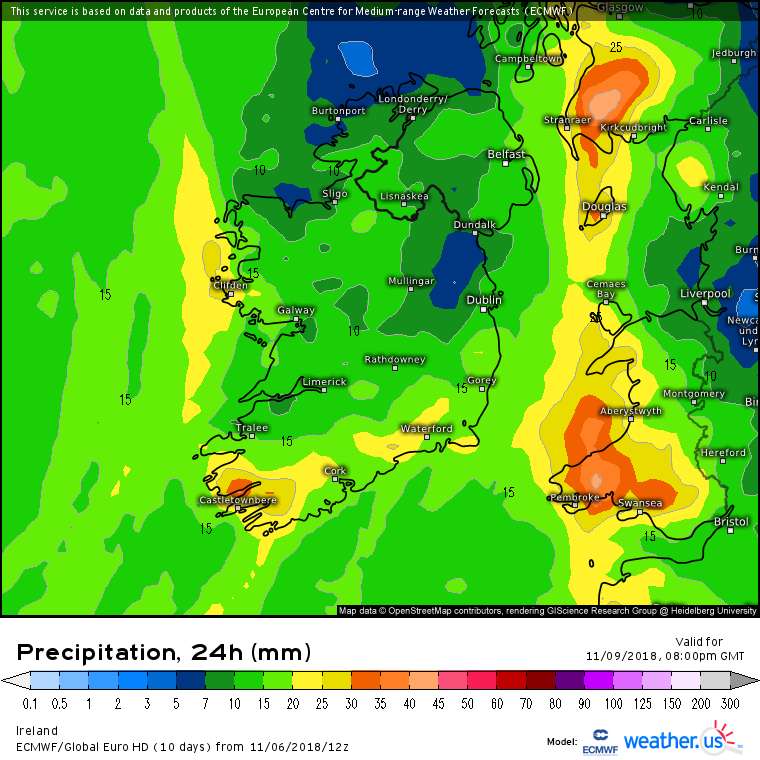 Some early indications of possibly being very wet for a time on Fri also. 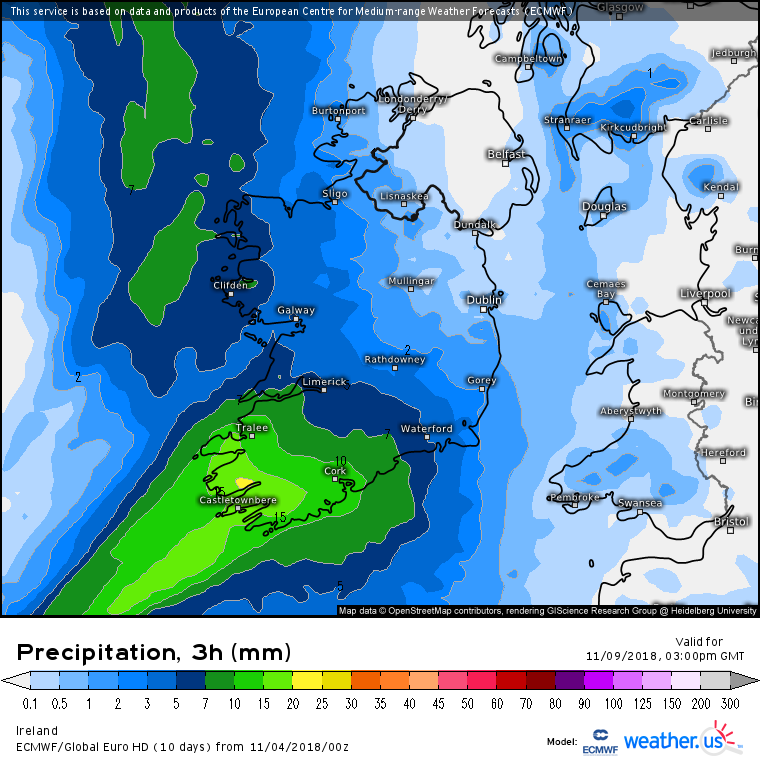 Rough idea of totals for the week , spot flooding an issue as the week goes on, the land in the SW / S and SE becoming quite wet if not saturated by the weekend perhaps, lots of run off from high ground. 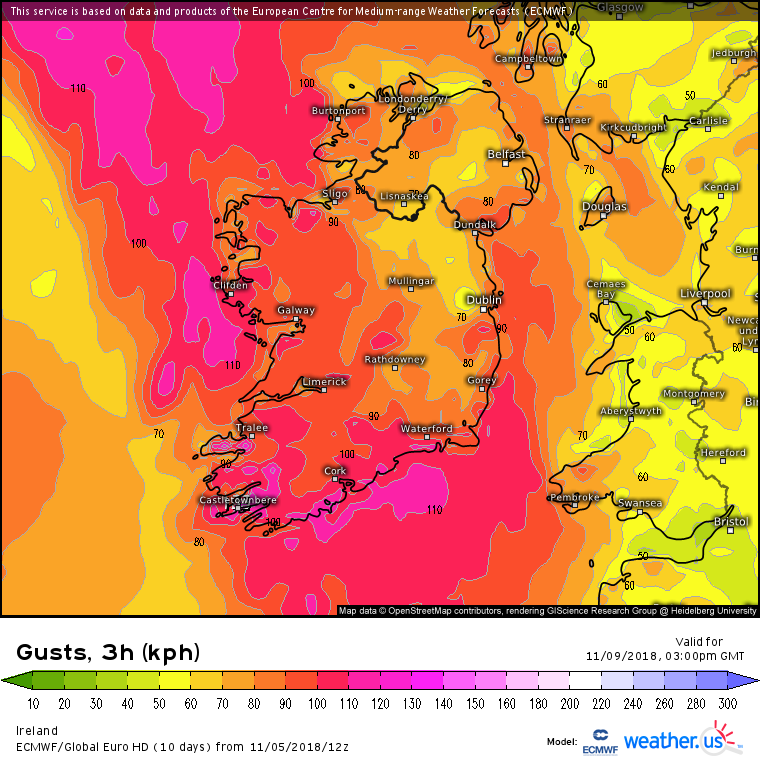 Wet and blustery during the frontal passage tomorrow, more so in the S of the country . 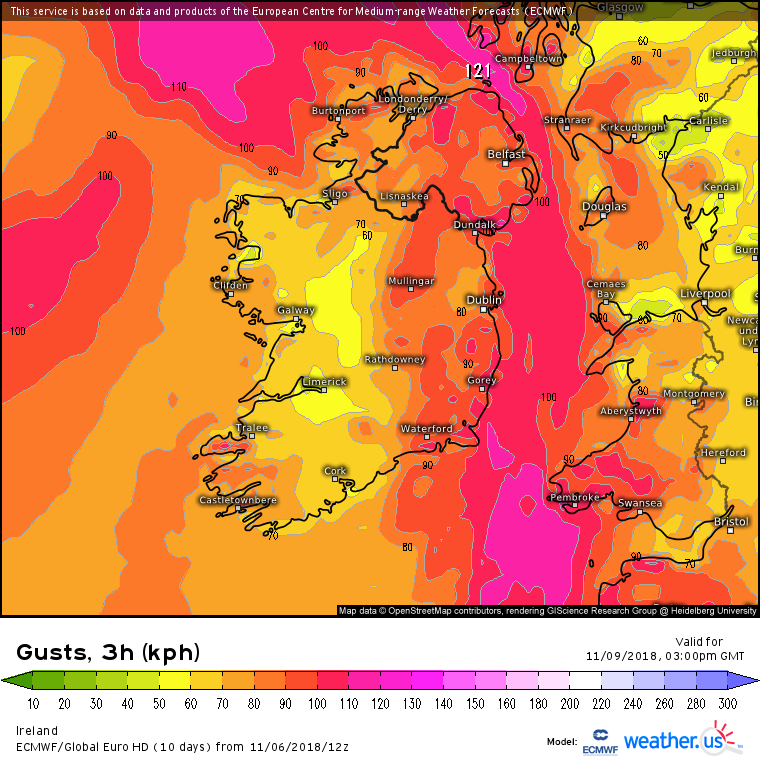 A couple of squall lines perhaps tomorrow ? 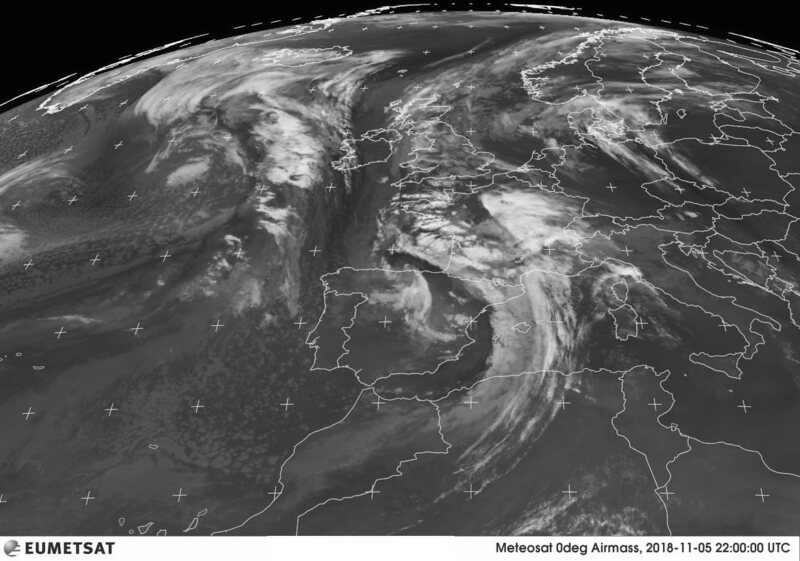 Weather approaching the SW / W now. 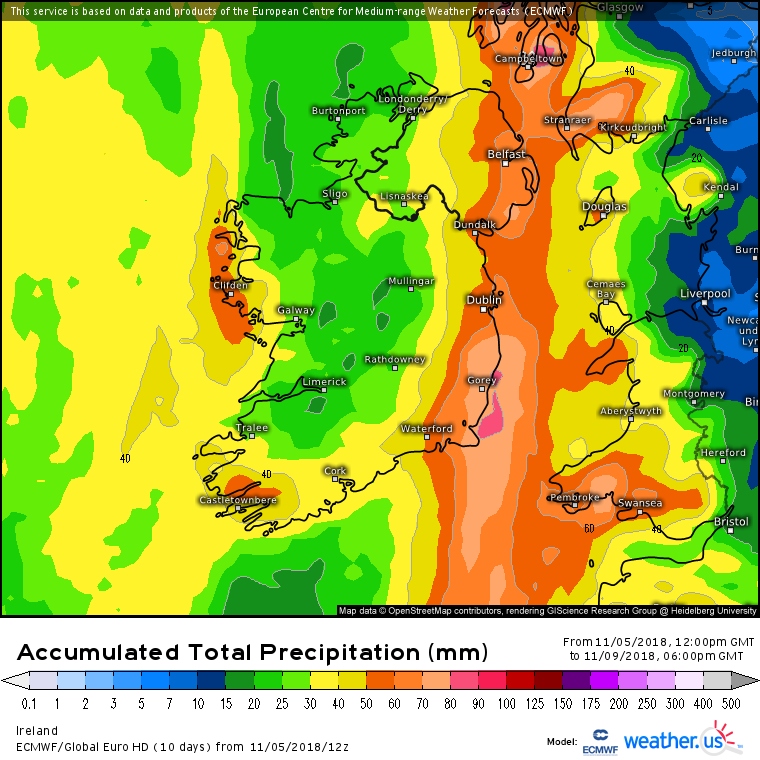 Some big rain totals coming in by Fri evening . 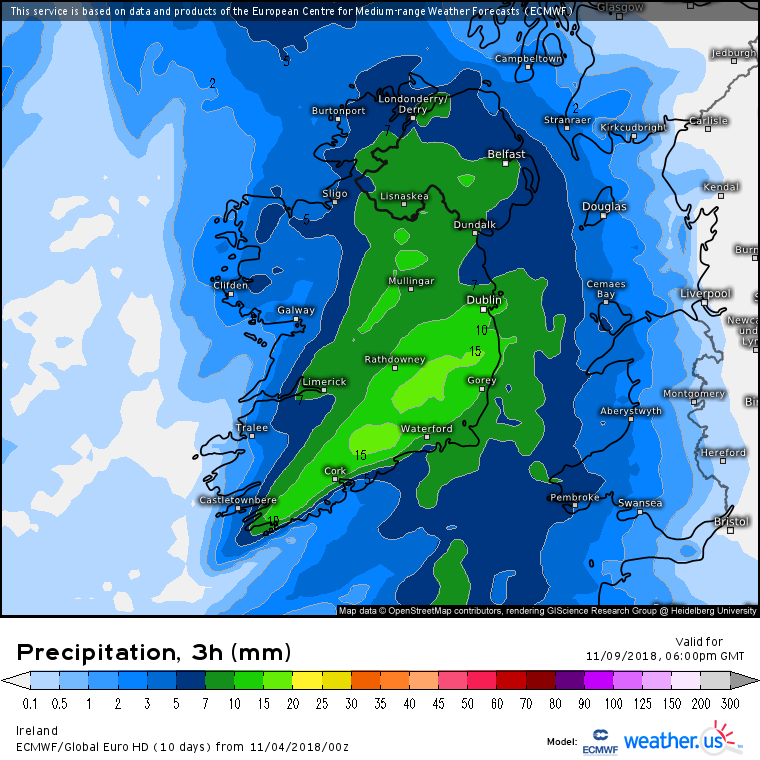 A lot more rain on top of the 81.6mm mickger844posts recorded in the last 3 days in Waterford . 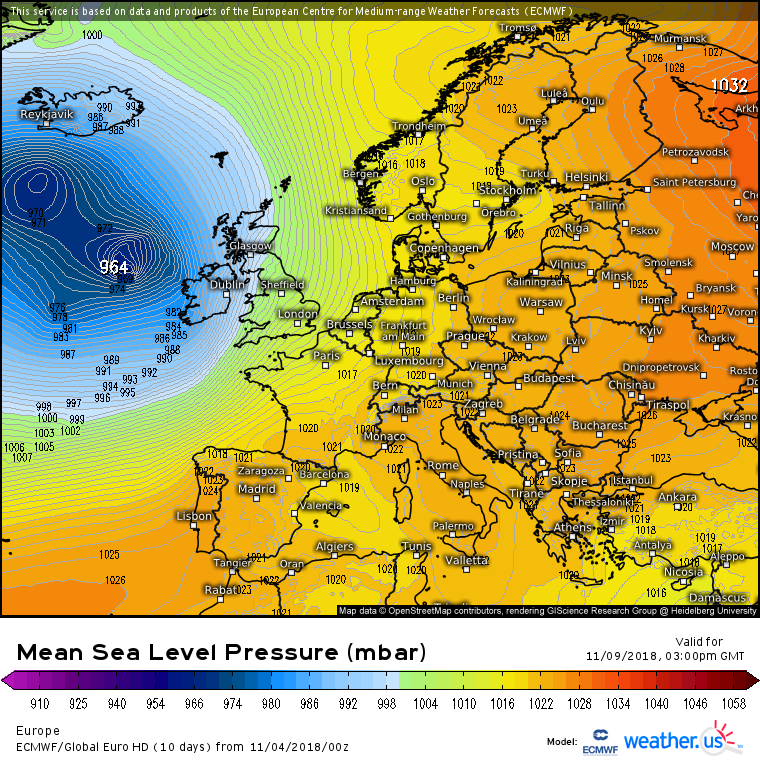 A possible 50 or 60 mm more on the way it would seem according to the ECM. 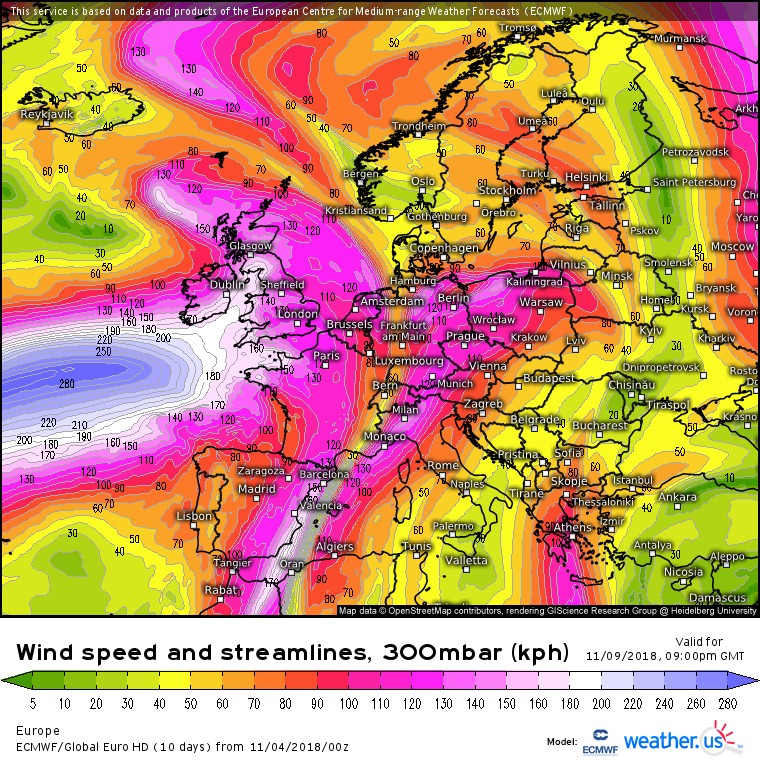 The European models keeping the Low on Fri further to the NW, the American models have a secondary deep low with the centre in over us keeping the strongest winds to the S. Could be a very wet day. 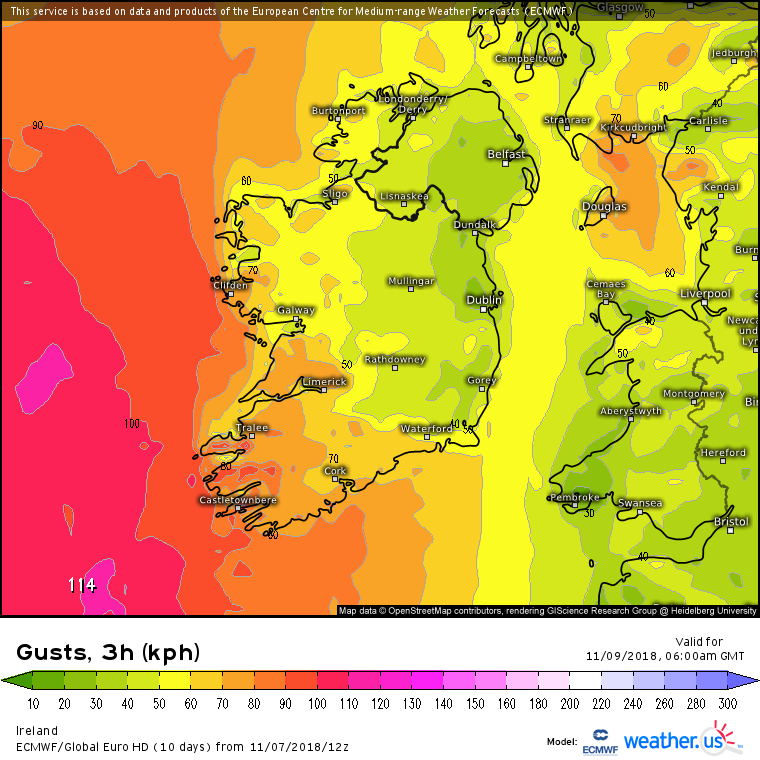 Looking very windy on coasts and windy overland on Fri as the depression deepens close to Ireland on the latest runs. 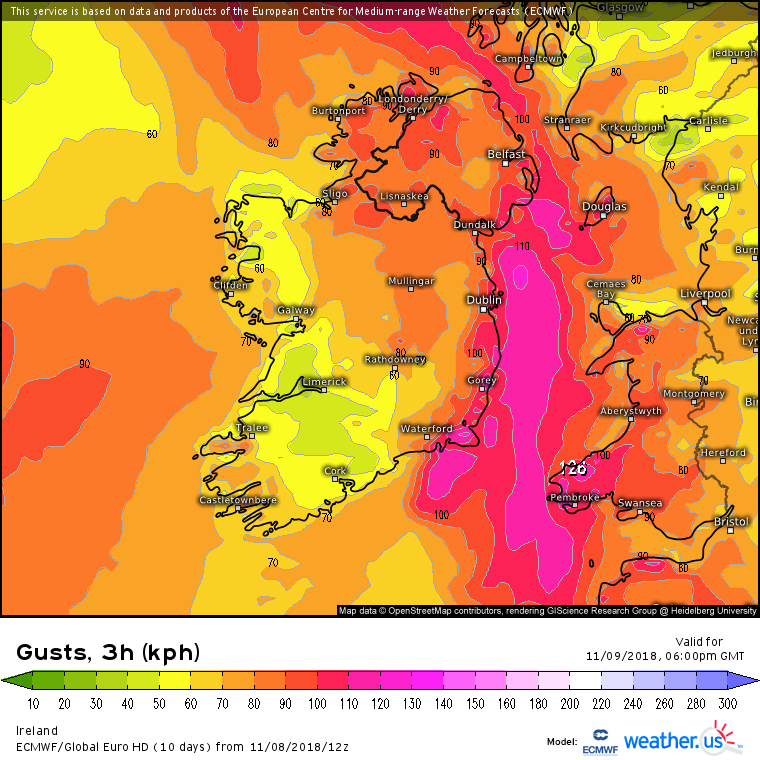 As the models get to grips with the set up they have been increasing the wind speeds a bit over the last few runs. 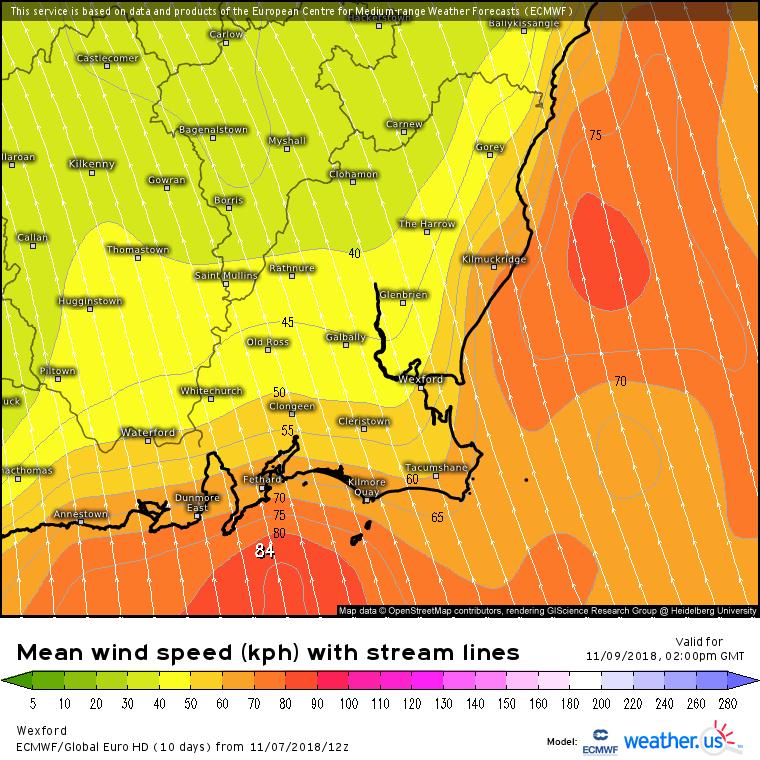 All now showing similar track and wind strengths. 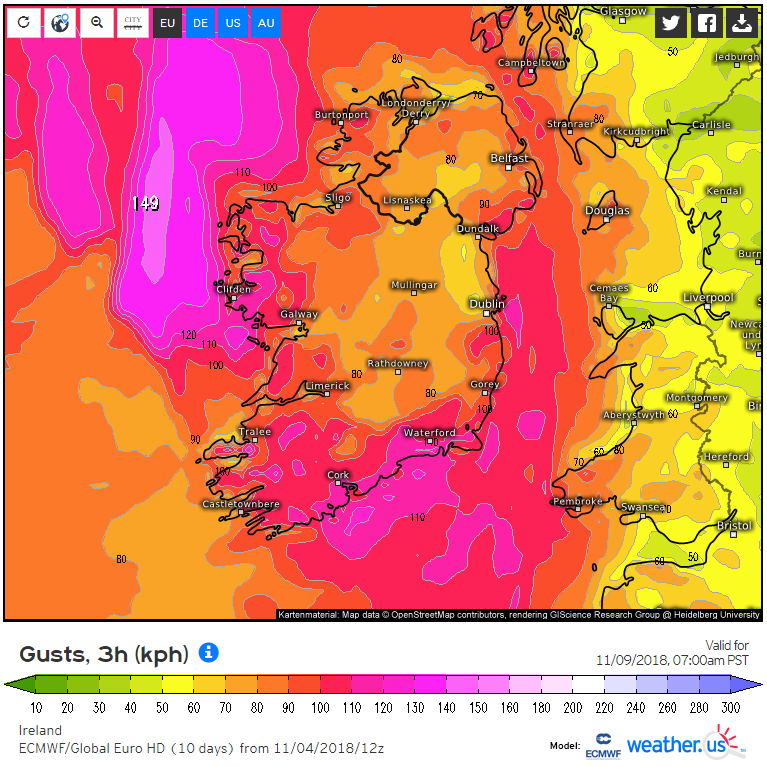 Probably still a bit under for being a named storm but wouldn't take much more additional wind speed to get a name.. Would have an impact in the UK also. 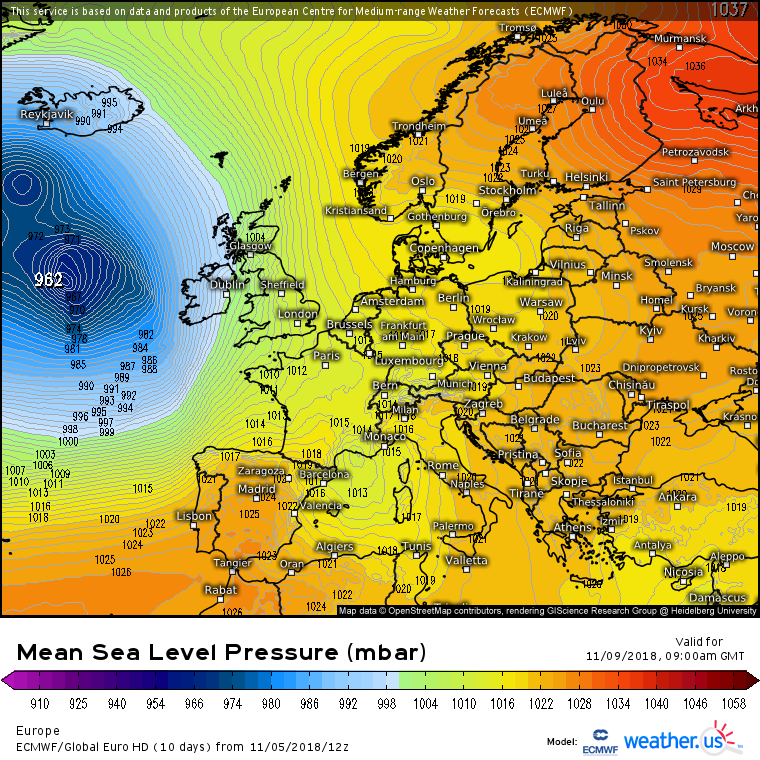 Not sure which met office names the next one. 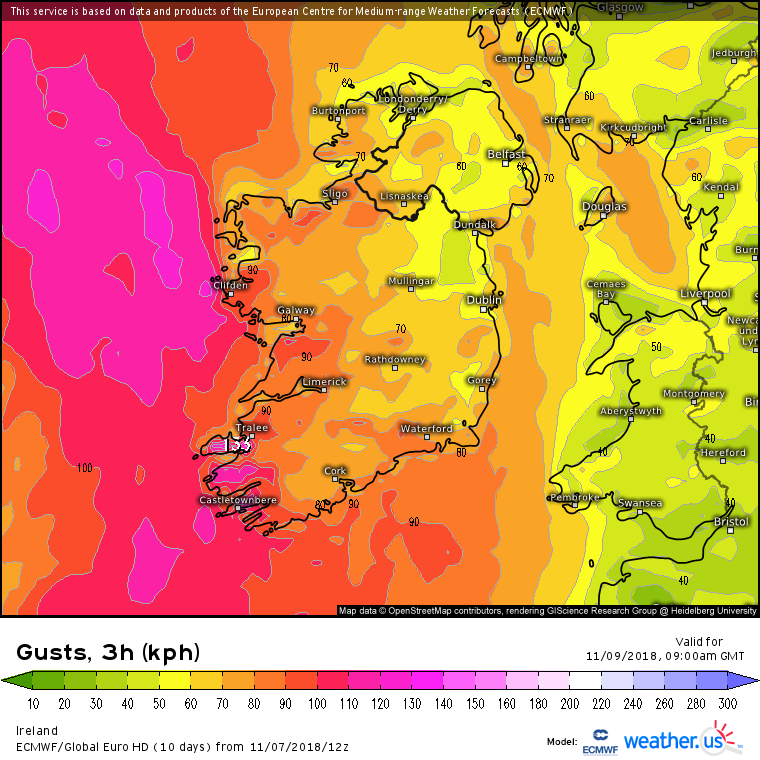 Currently looking like gusts up to 110 km/h on coasts , with some exposed headlands getting up to 120 km/h. 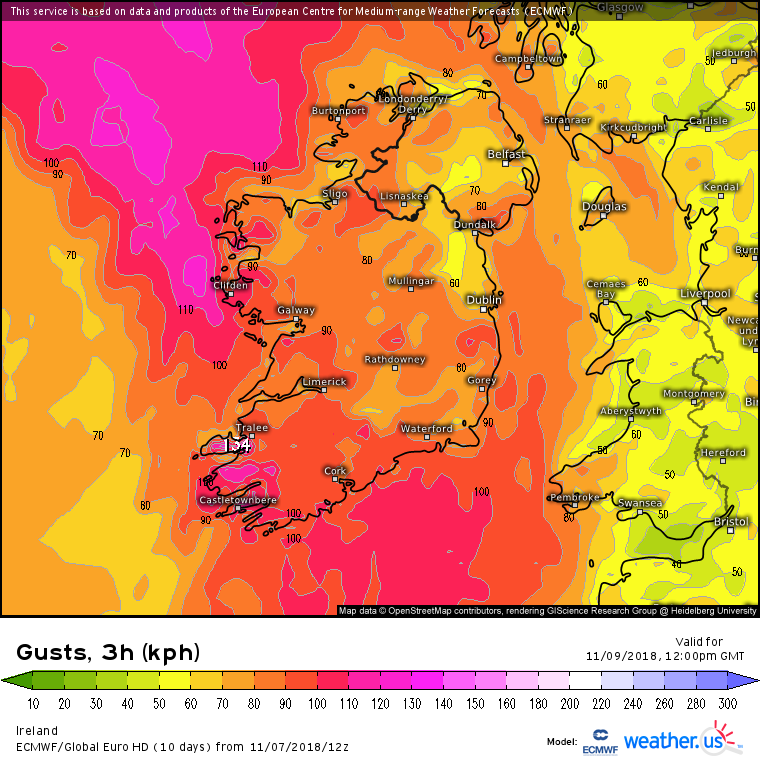 Gusting 80 to 100 km/h overland, with a few gusts to 110 possible in higher exposed ground. 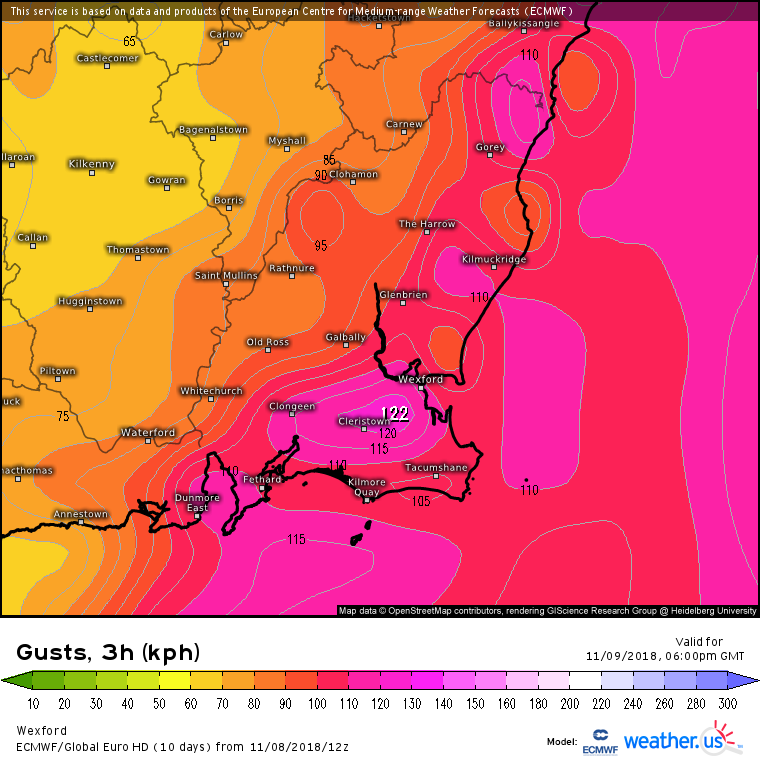 All the main models looking quite similar now. 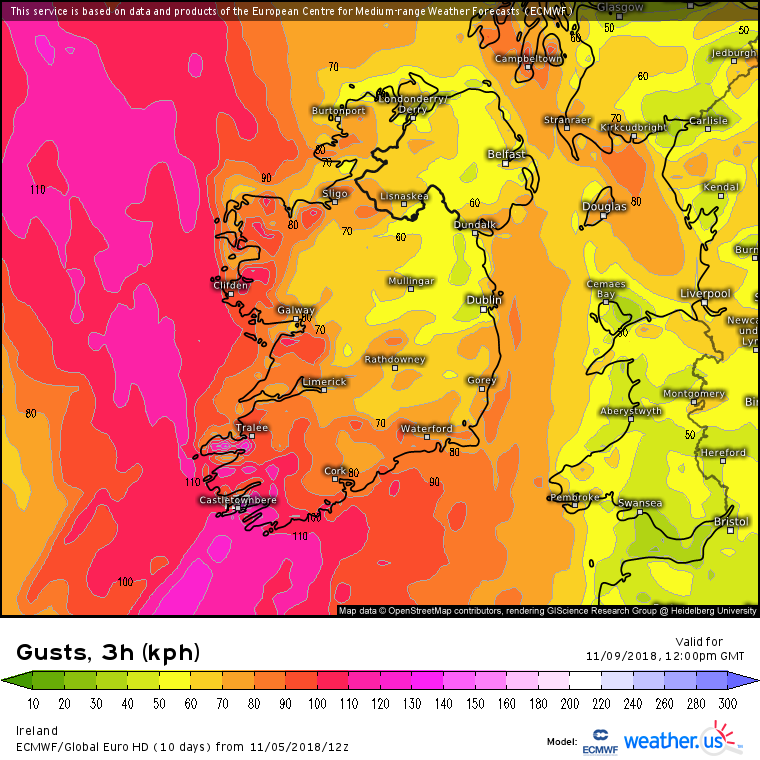 Fast moving systems, with the strongest winds moving over in a few hours for most. 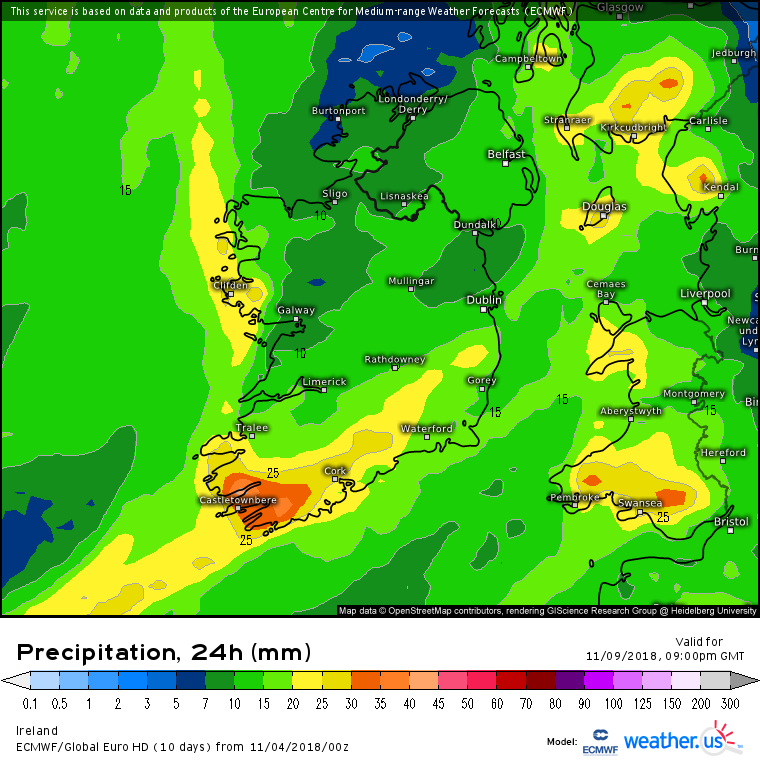 The charts showing a bit less rain Fri than previous runs .The closer the depression gets to Ireland keeping the heaviest rain off the E coast and closer to and over the UK. Looking like between 10 and 30 mm, and much of it falling in a few hours. 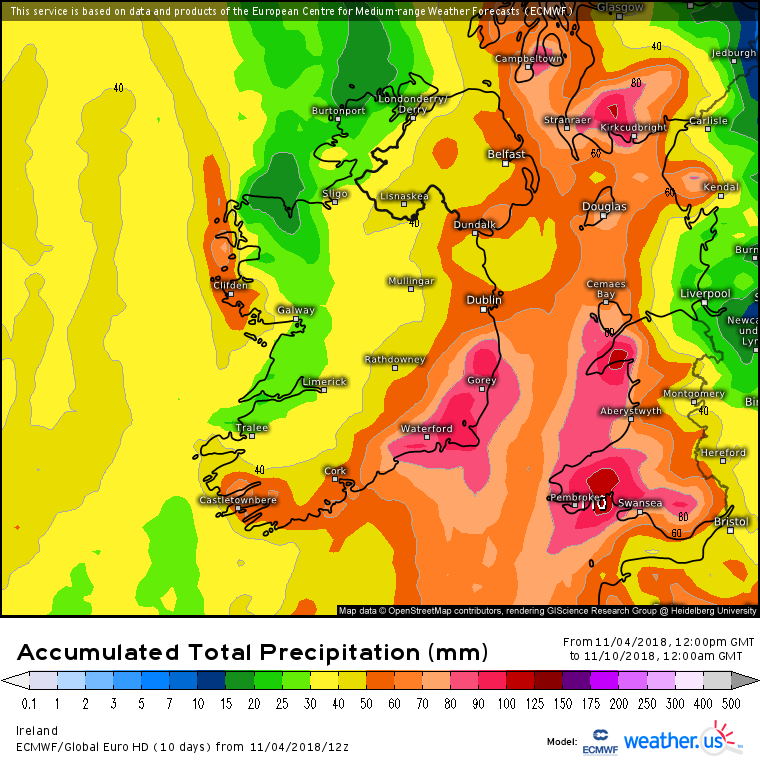 Projected Precipitation Totals up until +120 hrs. Last edited by Meteorite58; 06-11-2018 at 19:40. 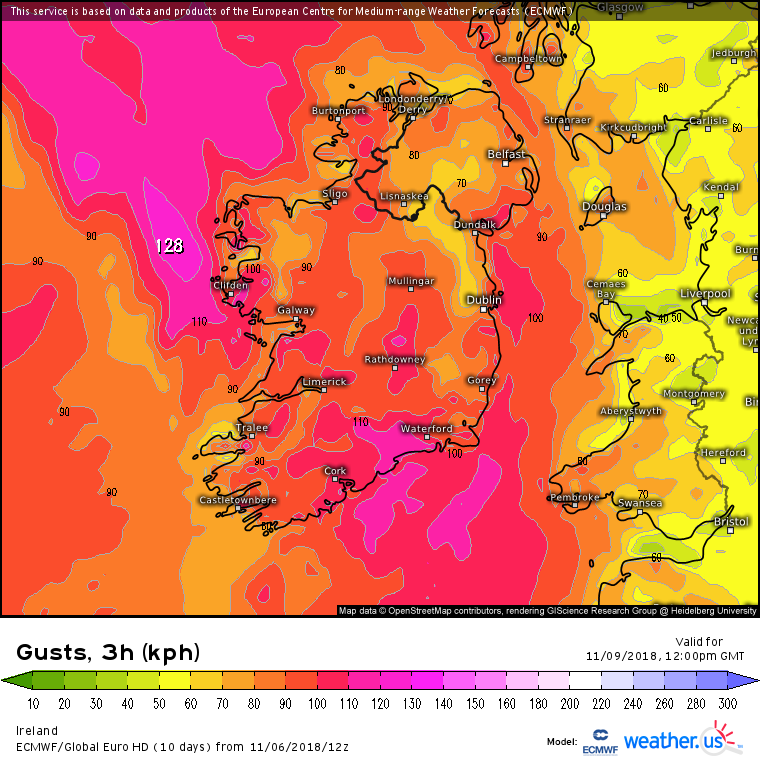 I think the winds haven't increased over the last few runs for Fri. Maybe ever so slightly down a bit in general, more so over land but still very windy on coasts. 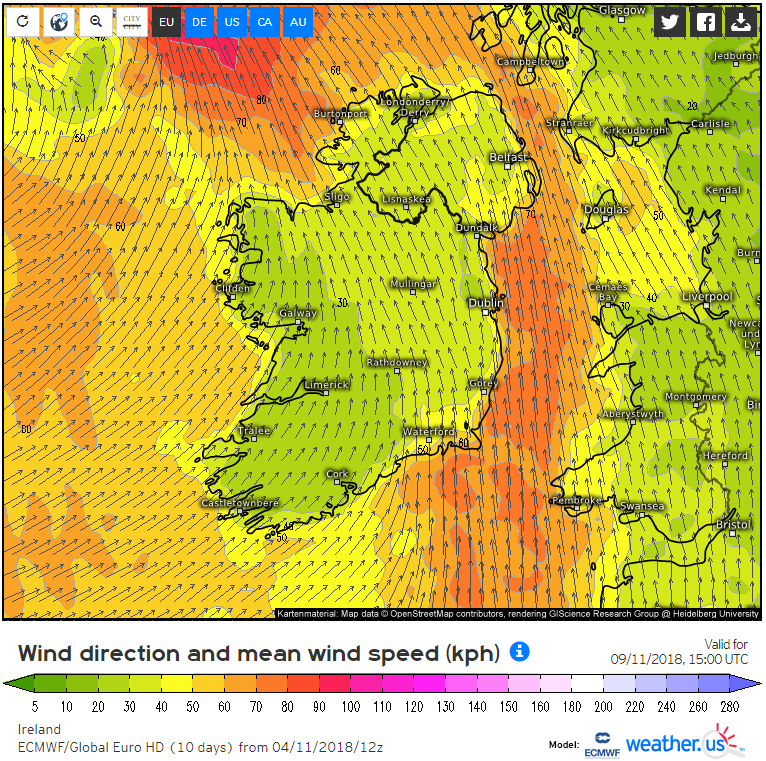 What does seem to be showing up is very strong winds onto the S , SE and moving to E and NE coasts later from S and SSE winds backing to the SW later. 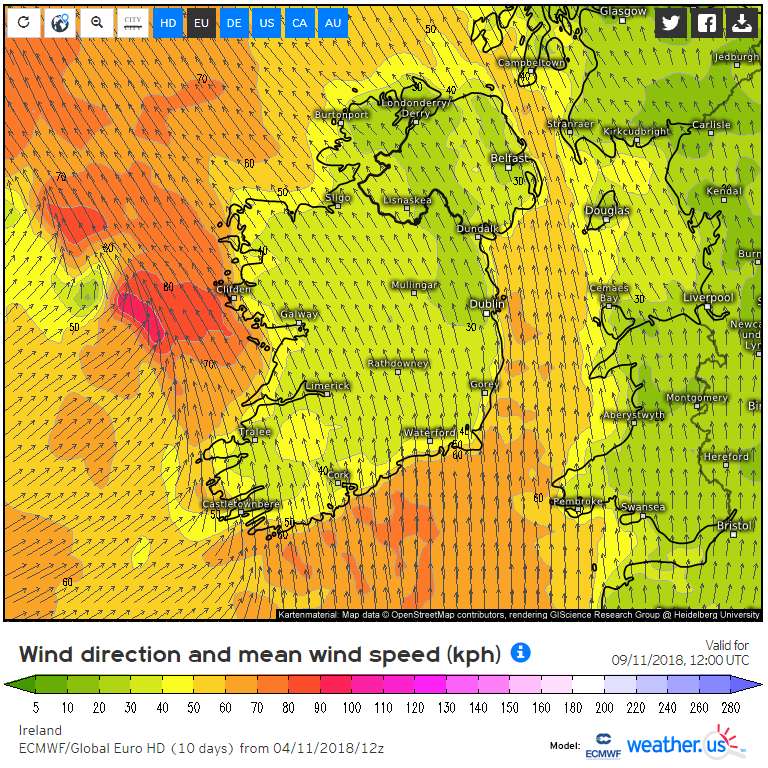 Atm IMO looking like 90 -100km/h on coasts in general, could gust to 110 on S, SE , E and NE coasts. 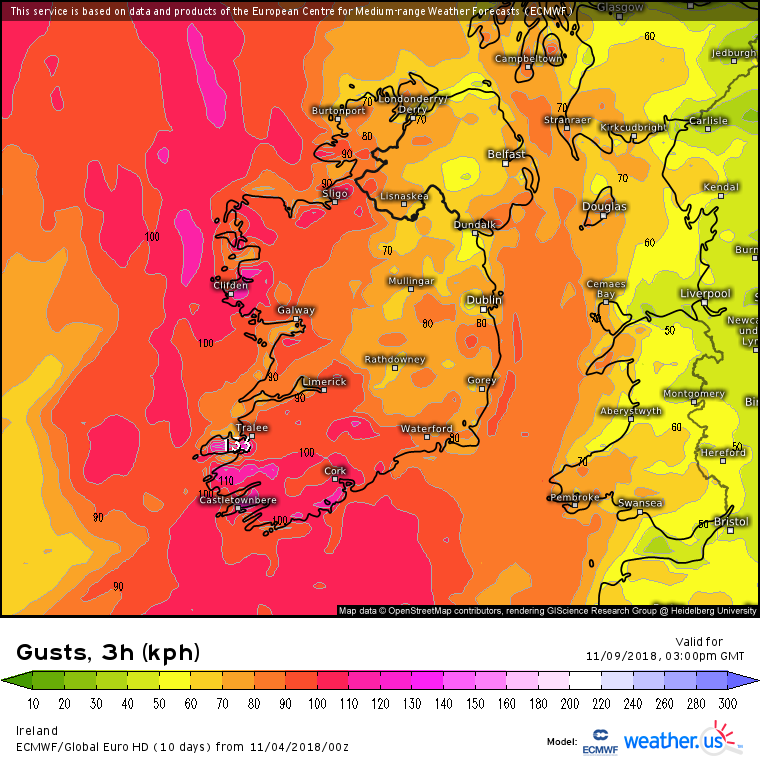 Overland could gust 80 - 90km/h approx but for a short time as the weather moves through quickly ( maybe slightly higher in the SE and E ) . Looks like quite heavy rain passing through quickly also. Latest ARPEGE 18Z similar to the last run. 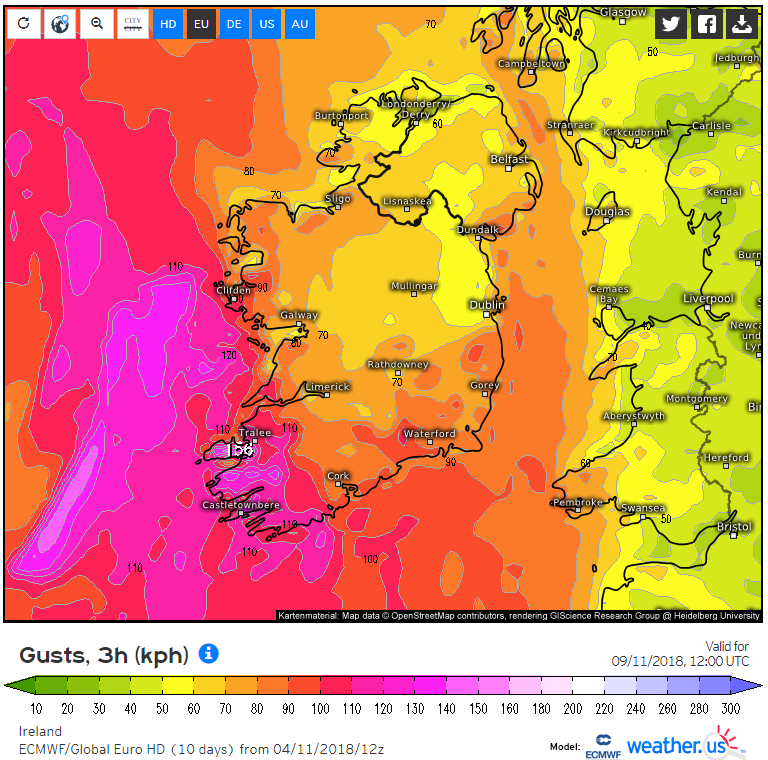 The SE and E showing up with quite high totals on some of the models up to late Fri. Kerry / W cork showing up with some high totals. 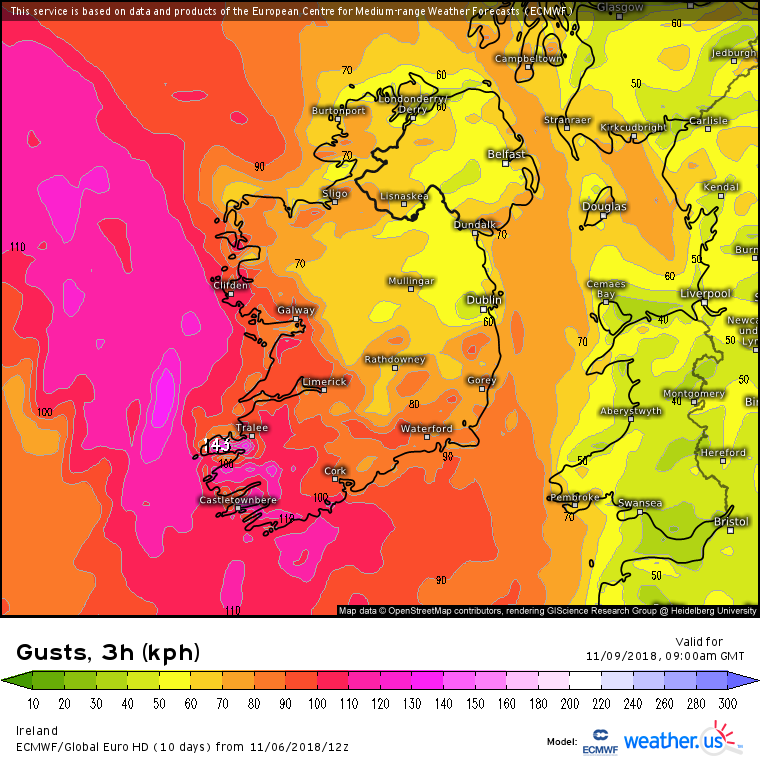 Mean speeds in the SE, strongest winds moving through in a few of hours. 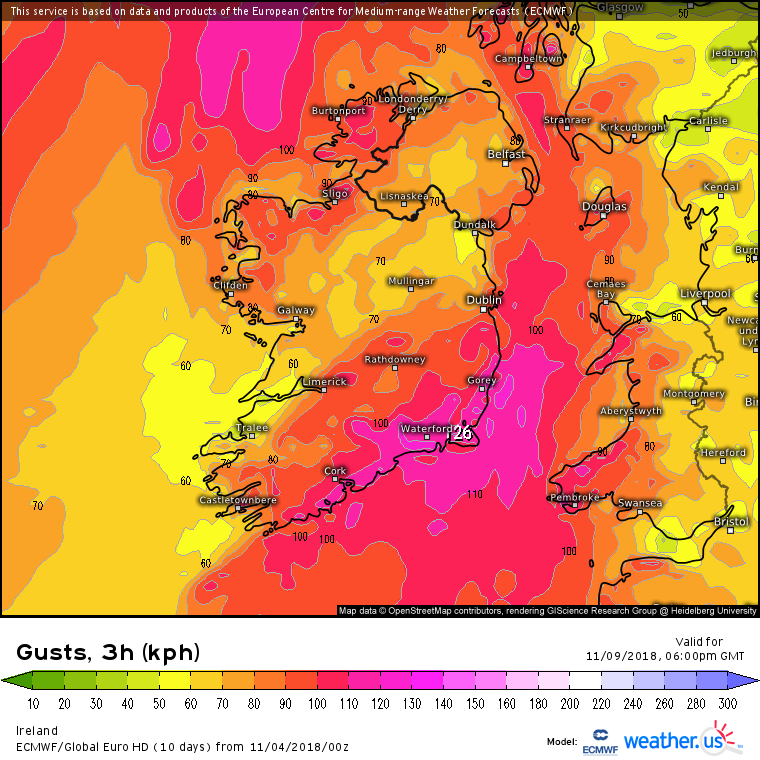 The models haven't deviated much over the last few runs except the ECM showing slightly lower top wind speeds in general but more widespread gusting 80 to 90 km/h across the country. 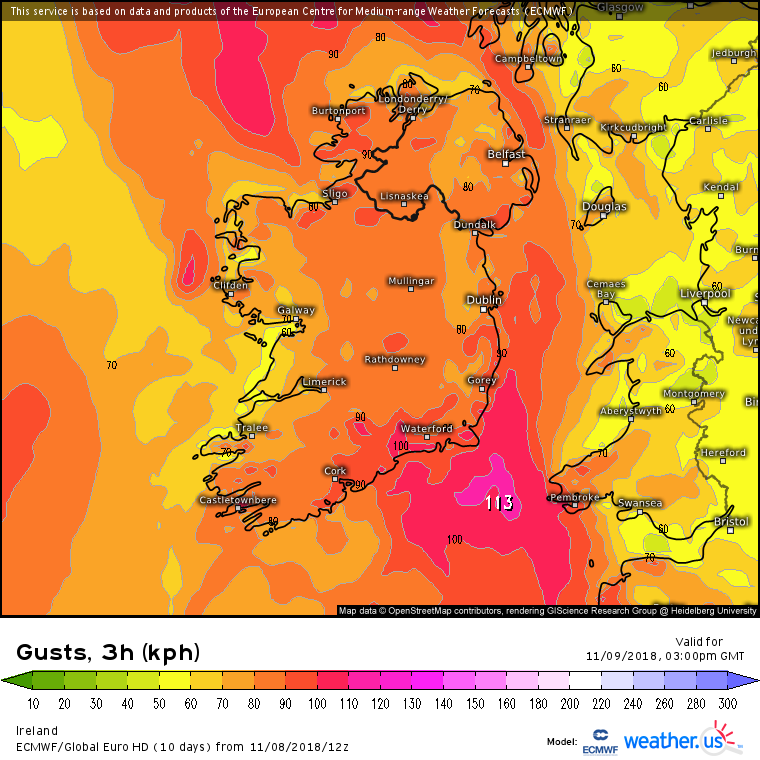 Would take note that the models have been showing the SE / E getting clipped by very strong winds for a time especially Wexford which may get the highest wind speeds. 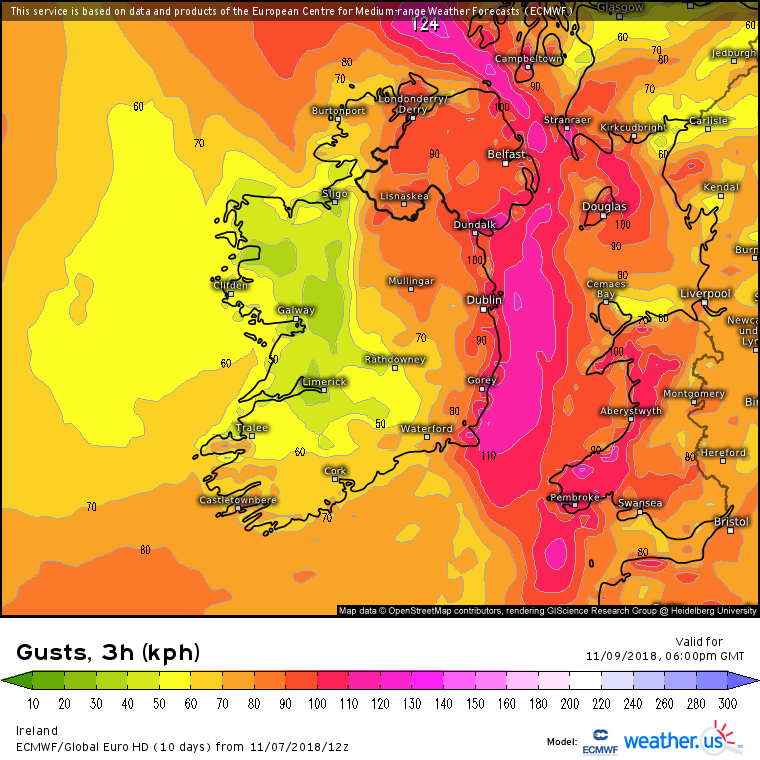 Tomorrow is more about the combination of strong winds and heavy rain leading to difficult conditions.